There has been a surge of conversations about the tech industry lacking diversity. Companies are therefore encountering barriers in innovation. The current state of technology faces inequality and privilege, a consequence of having limited voices represented in the design and product development process. In addition, we live in a challenged political and socio-economic state where it’s easier to be divided than come together despite differences. Design’s role in companies is becoming less about visual appeal and more about hitting business goals and creating value for users. Therefore, the need to build teams with diverse perspectives is becoming imperative. 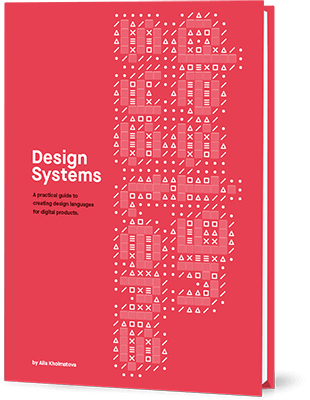 Design will not only be critical to solving problems on the product and experience level, but also relevant on a bigger scale to close social divides and to create inclusive communities. Diversity is in perspectives and values, which are influenced by both inherit traits (such as ethnicity, gender, age, sexual orientation) as well as acquired traits that are gained from various life experiences (cultural influences, education, social circle, etc.). A combination of traits shape people’s identity and the way they think. Diversity is important because it directly affects long-term success, innovation, and growth. Advantages of working on a diverse team include increased collaboration, effective communication, well-rounded sets of skills represented, less susception to complacency, and active efforts for inclusivity are made earlier in the process. What Is The Competing Values Framework? The positive correlation between diversity and innovation are undeniable. So how exactly does it work? Having differing and oftentimes clashing perspectives on a team seems to hinder progress rather than drive it. But with the right balance of values, this dynamic is extremely advantageous. Design, as a problem-solving discipline, uses insights to drive innovation, which can only manifest between differences, not commonalities. When different perspectives and values are represented, blind spots become more apparent and implicit biases are challenged. This is illustrated in the Competing Values Framework, a robust blueprint that was devised by Quinn and Rohrbaugh, based on researching qualities of companies that have sustainably produced a steady stream of innovative solutions over the years. This model for organizational effectiveness shows how different perspectives translate into business values, as well as show where their weaknesses are. People with characteristics from the Collaborate quadrant are committed to cooperating together based on shared values. They foster trust with each other and with their audience through compassion and empathy. Their priorities are long-term growth of communities and commit to learning and mentoring. While a sense of unity might help a team be more purpose-driven, this can discourage individuals who think differently to bring new ideas to the table because they are averse to taking risks. People here also lose sight of the realities of constraints because they look too far ahead. 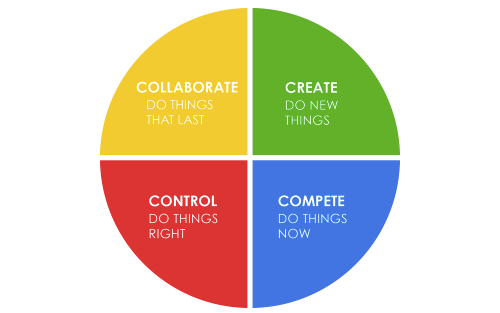 While most people are hesitant to change and innovation, those in this quadrant embrace it. They’re extremely flexible with a shifting landscape of user and business goals and aren’t afraid of taking risks. Creatives see risk as an opportunity for growth and embrace different ways of thinking to come up with solutions. Trends are set by creatives, not followed. In contrast, however, those in this quadrant aren’t as logical and practical with the execution needed to bring ideas to life. Their flexibility can become chaotic and unpredictable. Taking risks can pay off significantly but it’s more detrimental without a foundation. As the name implies, people here are competitive and focus on high performance and big results. They’re excellent decision makers, which is why they get things done quickly. They know exactly how to utilize resources around them to beat competitors and get to the top of the market. Competitors stay focused on the business objectives of increasing revenue and hitting target metrics. On the other hand, they’re not as broad of a visionary in the long run. Since they prioritize immediate results. Because of this, they may not be as compassionate towards their audience and not consider the human side of company growth. People in this quadrant focus on creating systems that are reliable and efficient. They’re practical and can plan strategically for scaling, and they constantly revisit their design processes to optimize for productivity. They are extremely detail oriented and can identify areas of opportunities in the unexpected. They’re also experts at dealing with multiple moving parts and turn chaos into harmony. But if there are too many Control qualities on a team, they become vulnerable to falling into complacency since they depend on reliable systems. They are averse to taking risks and fear the nature of unpredictability. People and their values don’t always neatly fit into categories but this framework is flexible in helping teams identify their strengths and weaknesses. Many individuals have traits that cover more than one quadrant but there are definitely dominant qualities. Being able to identify what they are on an individual level, as well as within a team and at the company level is important. How Do We Use The CVF To Build Diverse Teams? There are already many great design processes and frameworks that takes aspects of the CVF to help teams take advantage of diverse perspectives. 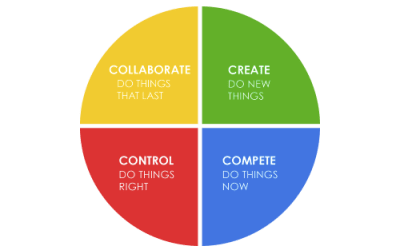 The sprint model, developed by the design partners at Google Ventures, is an excellent workflow that brings together differing values and skill sets to solve problems, with an emphasis on completing it in a short amount of time. IDEO’s design thinking process, also referred to human-centered design, puts users at the forefront and drive decisions with empathy with collaboration being at the core. What has the team dynamic been like for the past year? What progress has been made? What goals (business/user/team) are the most important? Whether this would be directly for client work or for building team rapport, it’s valuable to get people out of the office to experience things outside of their familiar scope. It’s worthwhile for design teams to interact with users and spend time in their shoes, not only for their own work as UX practitioners but also to help expand their worldview. They should be encouraged to constantly learn something new. They should be given opportunities to travel to places that are completely different from their comfort zone. Teams should also be encouraged go to design events and learn from industry experts who do similar work but in different contexts. Great ideas emerge when people experience things outside their routine and therefore, should always get out and learn! Some companies have weekly roundtable session where each person on the team shares one thing he or she is appreciative about another person. Not only does this encourage high morale but also empowers teams to produce better work. At the same time, teams are given a safe space to be vulnerable with each other and take risks. This is an excellent way to bond over goals and get teams with differing perspectives together to collaborate. What Should Diverse Teams Keep In Mind? Acknowledging that while different ideas and values are important, they can clash if conversations are not managed effectively. Discrimination and segregation can happen. But creating a workspace and team dynamic that is open to discussion and a safe space to challenge existing ideas is crucial. People should be open to being challenged and ask questions, rather than get defensive about their ideas. Compromise will be necessary in this process. Communication barriers — How people say things can be different from how others hear and understand them. Misunderstandings could lead to crucial voices not always being heard. If a particular style of communication is accepted over others, people fear speaking up. They might hold the wisdom to make design decisions that could impact the business. If a culture of openness doesn’t exist, a lot of those gold mines never get their opportunities to see the light of day. Competition over collaboration — People on design teams need to work collaboratively but when different perspectives clash and aren’t encouraged to use their perspectives to create value for the company, they become competitive against each other rather than have the willingness to work together. It’s important to bring the team back to the main goal. Embracing different perspectives takes courage but it’s everyone’s responsibility to be mindful of one another. Being surrounded by people with different perspectives is certainly uncomfortable and can be a stretch outside their comfort zones. Design teams are positioned advantageously to do so and be role models to others on its impact. Conversations about leveraging differing perspectives should happen as early in the process as possible to limit friction and encourage effective collaboration. Rather than approach it as an obligation and something with a lot of risk, leaders should see it as a benefit to their company and team’s growth. It is often said that roadblocks are a sign of innovation. Therefore, when designers in a team are faced with challenges, they are able to innovate. And only through the existence different perspectives can such challenges emerge. Assessing where the company, teams, and individuals are within the CVF quadrants is a great start and taking steps to building a team with complementing perspectives will be key to driving long-term innovation.